Gorgeous love the contrasting colors! Makes me wish for spring. If I could eat this picture, I would. It would taste like lavender honey. 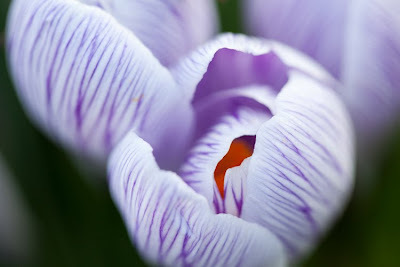 This reminds me that I have a serious lack of crocus in my life...maybe next year! Ohhh what I wpouldnt give to see a real live crocus now ! Beautiful picture , thankyou ! ohhhhh, so much lovelier than the crocus picture I posted today! No words. Okay, one. Wow! I have a serious lack of crocus in my garden too. Scrumptious! This is a beautiful image. I can hear it calling clearly, just as you did. I love the softness of the edges and the crispness around the center, framing the pistil in the mysterious interior of the flower. Thank you.